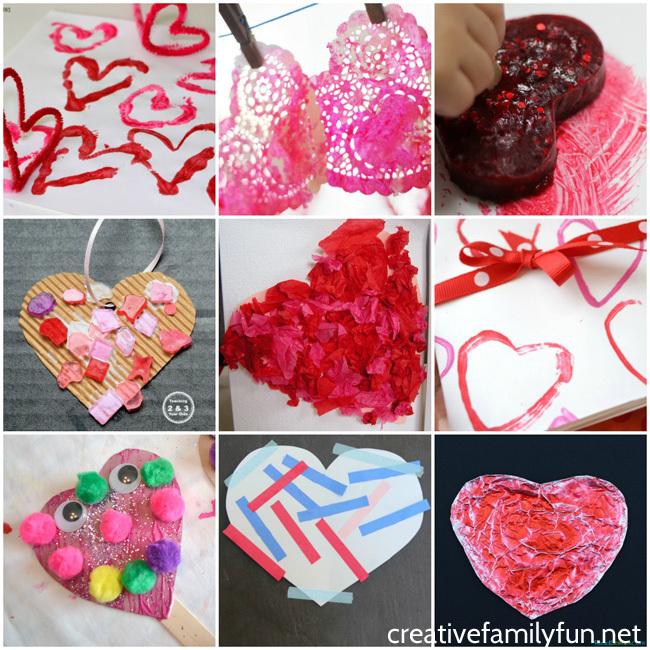 You can easily find so many ideas for Valentine crafts. 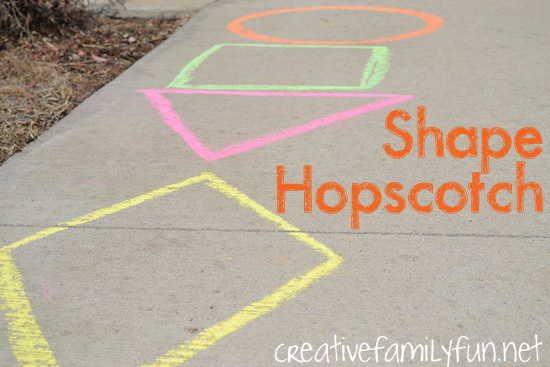 But, so often, those ideas are more suited for preschoolers and older kids (and let’s face it, adults). That doesn’t help when you’re looking for Valentine crafts for toddlers. 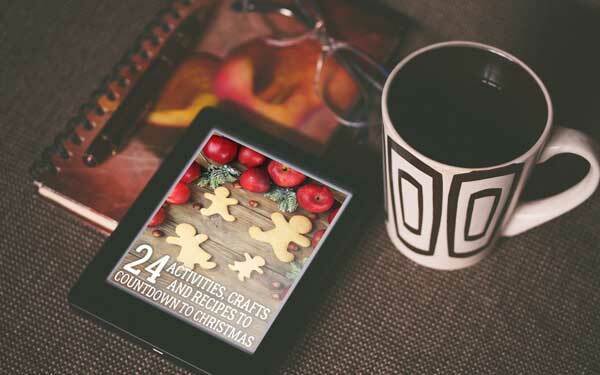 They need simple and doable projects, ones that they can have fun and do themselves. 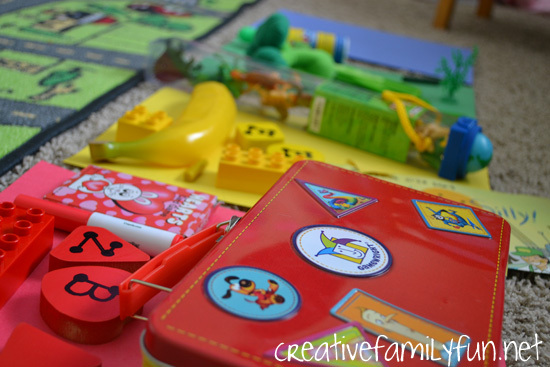 So, before you get sucked into the black hole of Pinterest, I’ve rounded up some fun Valentine’s day activities you can do with your toddlers. 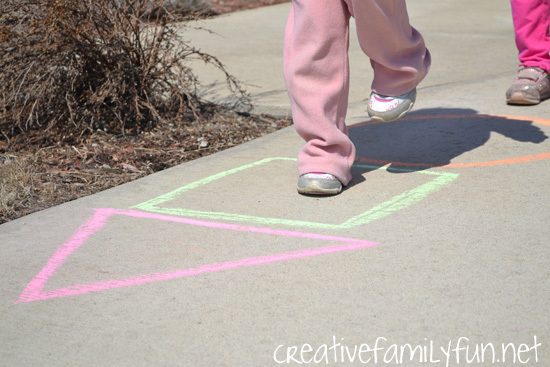 These ideas are all simple enough that your toddler can do themselves. 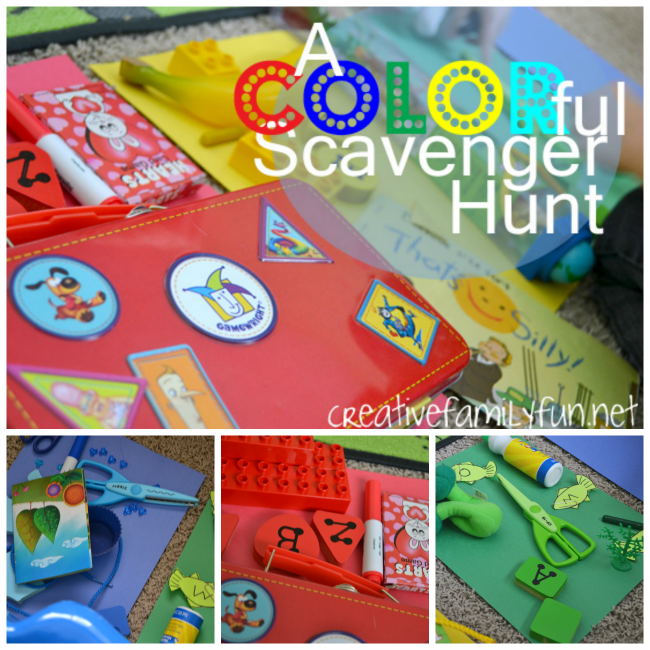 They’ll get messy, get creative, and have a whole lot of fun! 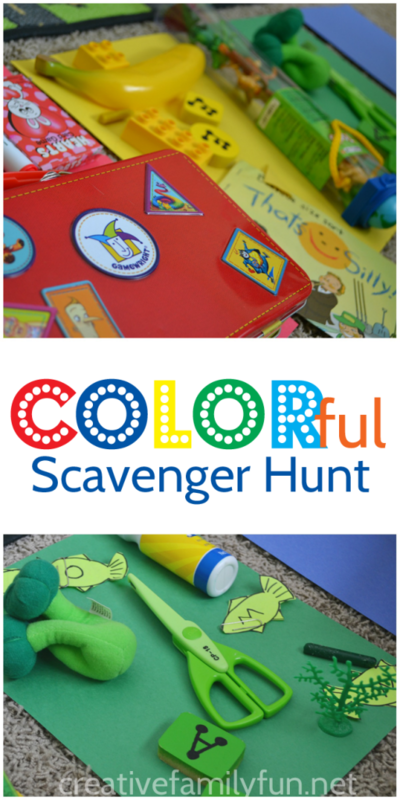 Plus, you’ll have tons of fun creating with them! Shape cardboard tubes into a heart shape for a printmaking Heart-Stamped Valentine Card project that’s fun for all ages. Silly Heart Puppets are easy to make and even more fun to play with. Little hands will love gluing strips of paper to create these adorable Paper Strip Hearts from Housing a Forest. 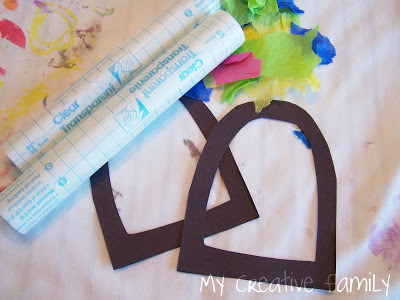 Paint with balls to make these super-fun Toddler Painted Heart Doilies from Hands On As We Grow. The end of a piece of celery makes a perfect heart shape. So, let your little one use celery stamps to make pretty valentines like these from How Wee Learn. Practice simple beading on pipe cleaners with this simple Beaded Valentine Heart Craft from Inspiration Laboratories. Paint with cotton swabs to make a pretty Q-Tip Painted Heart like this from Frogs Snails and Puppy Dog Tails. 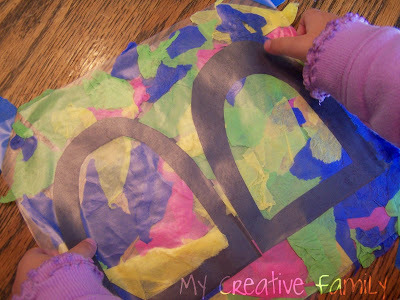 Use some glue and tissue paper to make these awesome Tissue Paper Heart Cards from Rainy Day Mum. Use a heart-shaped sponge to make some pretty printed Valentine’s Day Sponge Art like this great idea from Emma Owl. Paint with yarn to make these pretty Heart Suncatchers from Minne Mama. 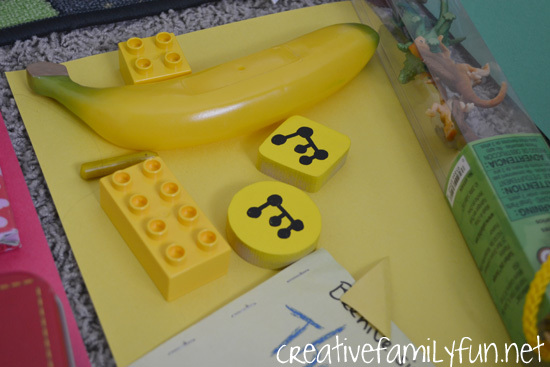 Sticking things on with glue is always a fun idea! 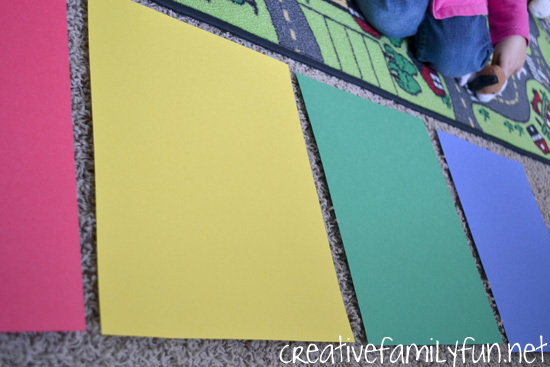 Use this simple concept to make pretty cardboard hearts like these from Teaching 2’s and 3’s. It’s fun and pretty to paint on foil. 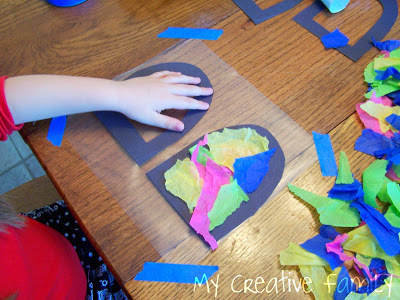 So your little one will love to create these Painted Foil Hearts from Read Science. 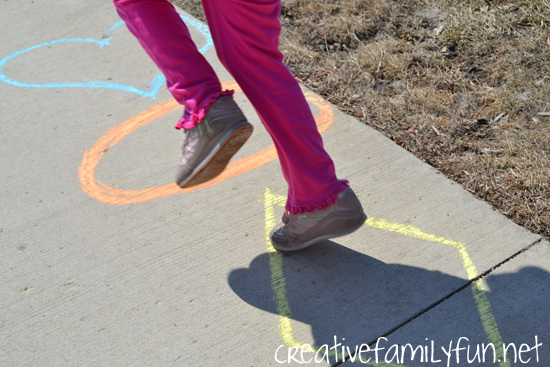 Make fun pipe cleaner heart stamps so your toddler can make a pretty Valentine’s Day Printmaking project like this from Where Imagination Grows. 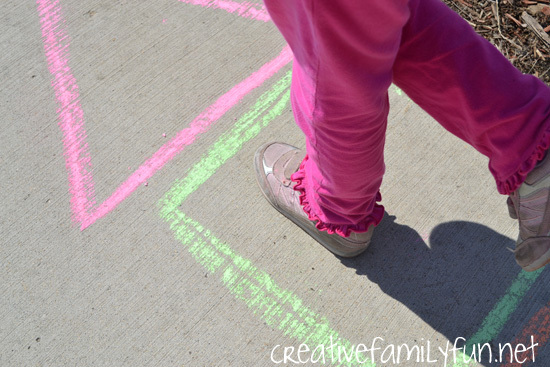 Use frozen hearts to paint a pretty picture with this fun sensory painting idea from Teaching 2’s and 3’s. Paint with balls of foil to create these unique Foil Textured Hearts from Crafts on Sea. Put out some supplies and let your toddlers decorate hearts that you can put together to form a pretty Valentine Hearts Bunting like this from Rainy Day Mum. 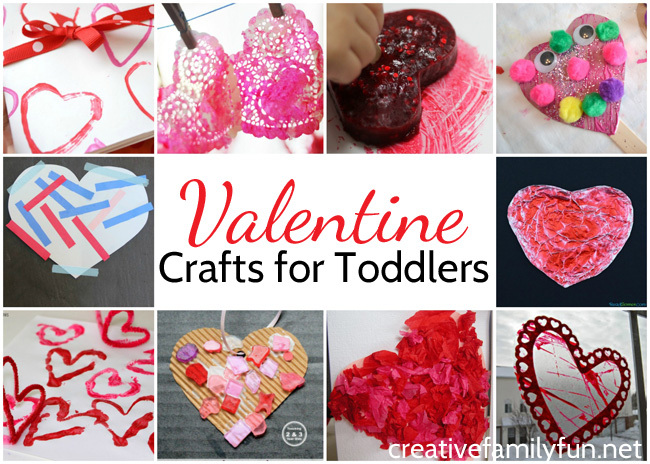 Which of these Valentine crafts for toddlers do you want to try with your little one? 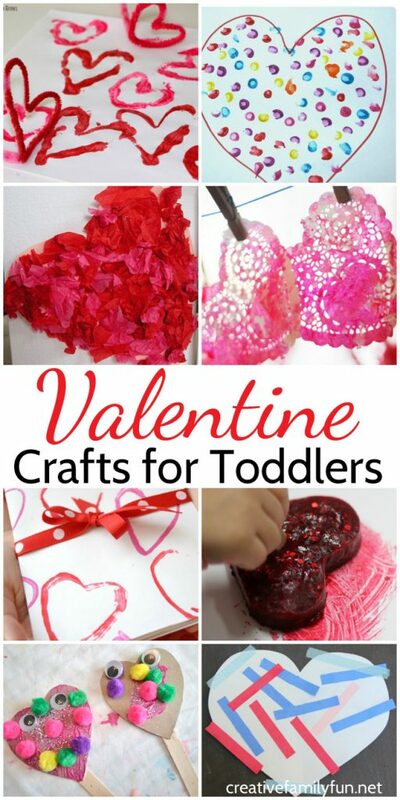 If you enjoyed these fun and simple Valentine crafts for toddlers, the above photo is perfect for sharing on Facebook or you can save the photo below on Pinterest. The girls love making new ornaments for our Christmas tree. In fact, if I ask them if they want to do a craft project, they usually tell me they want to make a new Christmas ornament. 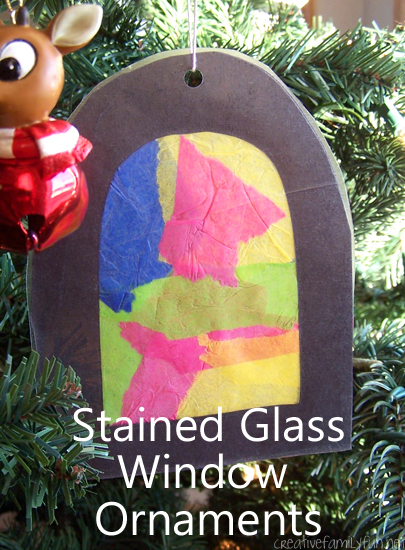 One of our recent creations was our Stained Glass Window Ornament. 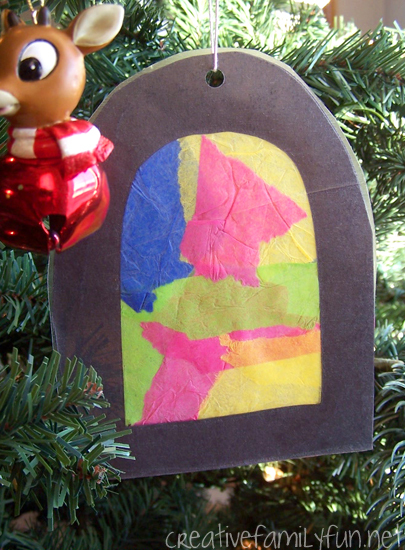 This was so easy to make and are a perfect choice if you’re looking for a mess-free kids’ Christmas craft. 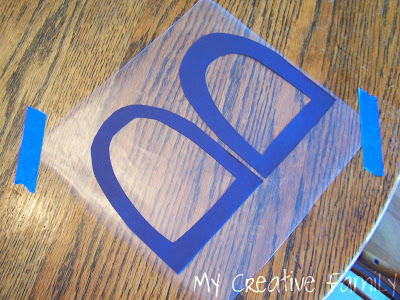 In order to prep this project, I cut the window shapes out of the black construction paper. You’ll need two window cutouts for each ornament. If you double-up the paper and cut two at once, it will make it much easier to match up the two pieces in the end. I taped down a piece of Contact Paper and placed the window pieces on it. Each girl was going to make two stained glass window ornaments. The girls started applying the tissue paper. Don’t worry about covering up the black construction paper, we’ll take care of that part later. My toddler, in particular, loved the stickiness of the Contact Paper. 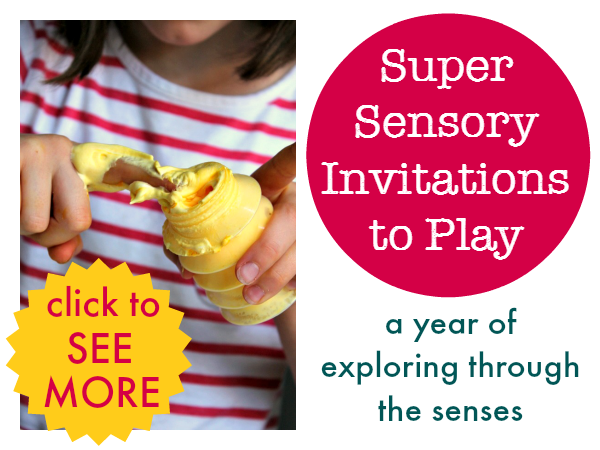 Not only was this a fun craft for her, but a great sensory experience as well. She wouldn’t stop applying tissue paper until the entire piece of Contact Paper was covered. After we were done with the tissue paper, we took the coordinating window pieces and lined them up with the ones already on the contact paper. 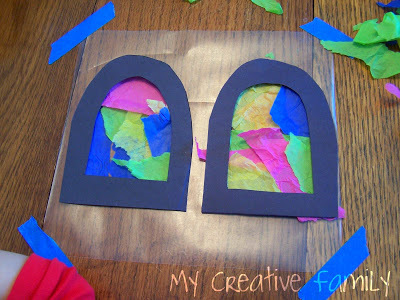 You will now have two window cutouts with tissue paper in between. Finally, cover the entire project with a second sheet of contact paper. 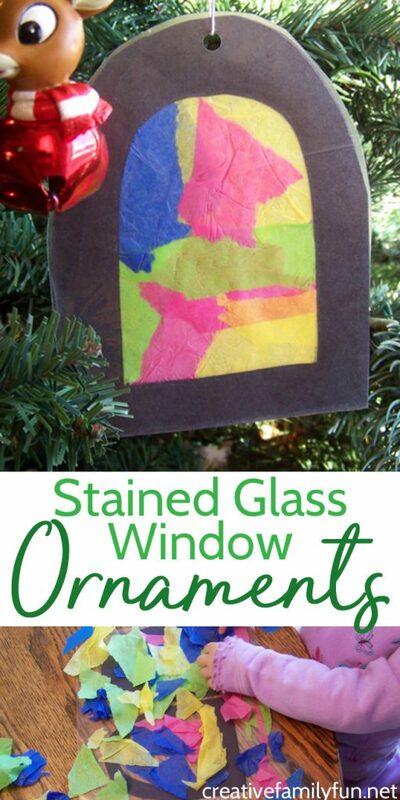 Cut out each window, punch a hole in the top and add a string for hanging on the tree. Voila, it’s done! Now, we have a beautiful Stained Glass Window Ornament hanging on our tree. Do you have any fun and simple ideas for Christmas ornaments? I’m running out of ideas! *Special note: This post was originally published in 2011. It’s a timeless activity that’s been updated for this year. I can’t imagine anything more fun and refreshing on a hot summer’s day than playing with ice. 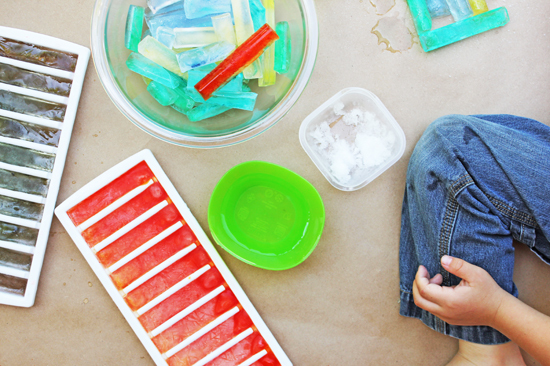 So, grab some fun ice cube trays and create some colored ice cubes (or sticks) for some creative fun. 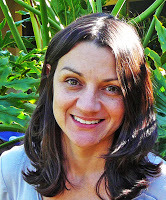 Hi there, I’m Ana from Babble Dabble Do and I’m excited to be guest posting on Creative Family Fun today! 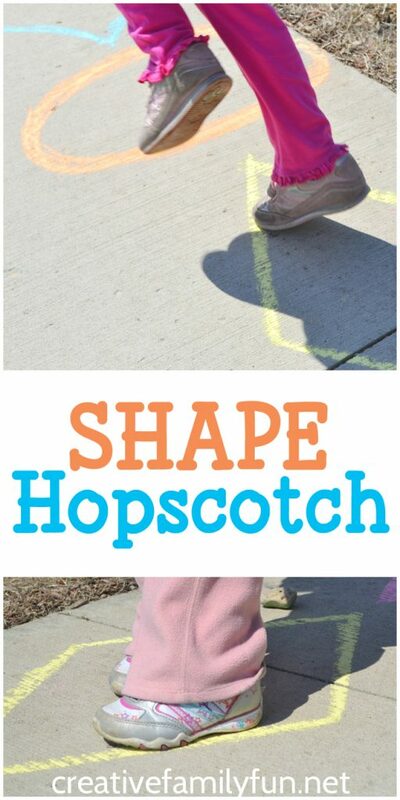 With summer finally here I’ve been itching to play with ice as a “cool” outdoor activity for the kids. If you’ve been to my blog you know I’m obsessed with color, and food coloring is something I use on a regular basis in our projects. This week I thought it would be fun to experiment with colored ice and see what interesting activities we could come up with! Ice cube trays and/or different molds- I used trays that make ice sticks for water bottles. The pieces of ice were like logs, perfect to build and draw with! cube tray molds. Freeze overnight or for several hours. 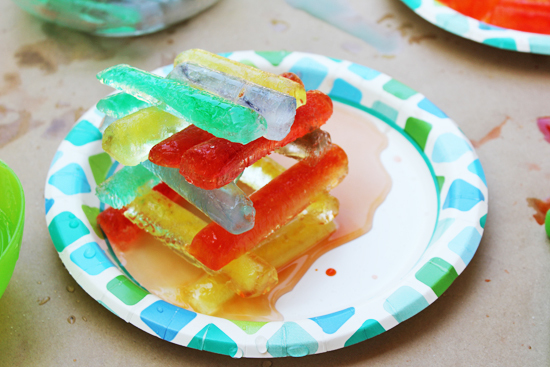 Stack your ice cubes on top of one another to try and make a structure. Using drops of water and shaved ice, “glue” the pieces of ice together. “Gluing” only worked for us about half the time. When finished, carefully move the sculpture back into the freezer to fuse it together! If you plan on refreezing, use a sturdy tray underneath the sculpture as too much movement will cause it to break apart. ice to make holes and give it texture. 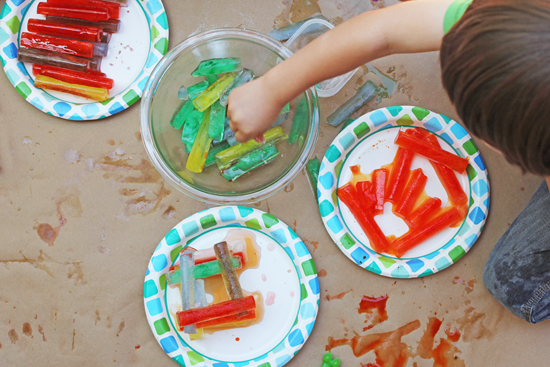 Using red, blue, and yellow ice sticks and three different bowls, encourage your child to experiment with color mixing. 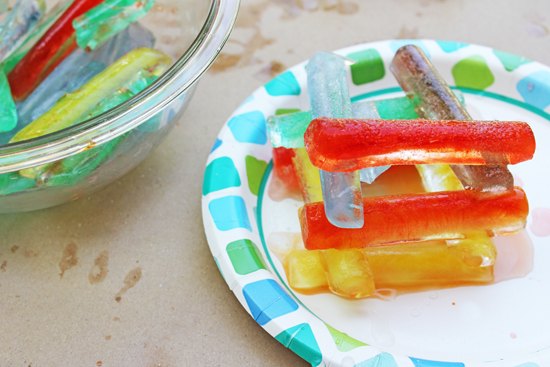 Let them melt two colored ice sticks in the same bowl to make a magical new color appear! 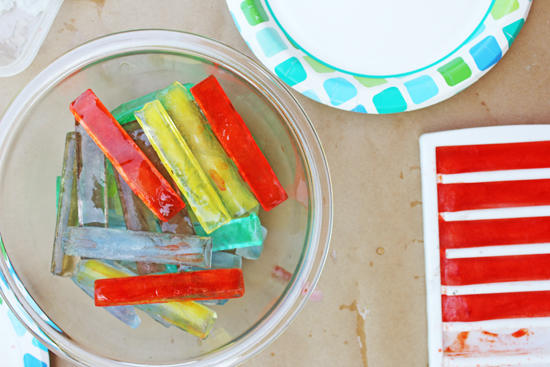 They might not last long in the blazing heat, but colored ice would make a fun addition to a water table. You’ll need to use a strong concentration of color for this one to work well; use the ice sticks like crayons to color on paper. 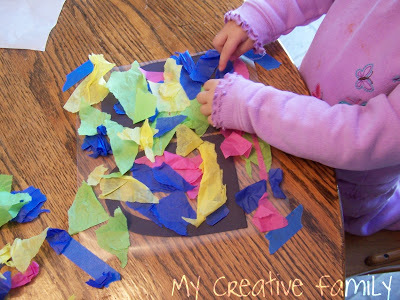 Place several ice sticks on a piece of white paper and let them melt to make a free form painting. I had originally planned to make only ice sculptures but when I gave my kids the ice sticks they had ideas of their own! They stacked and sorted them and just loved the sensory experience of playing with a cold material. 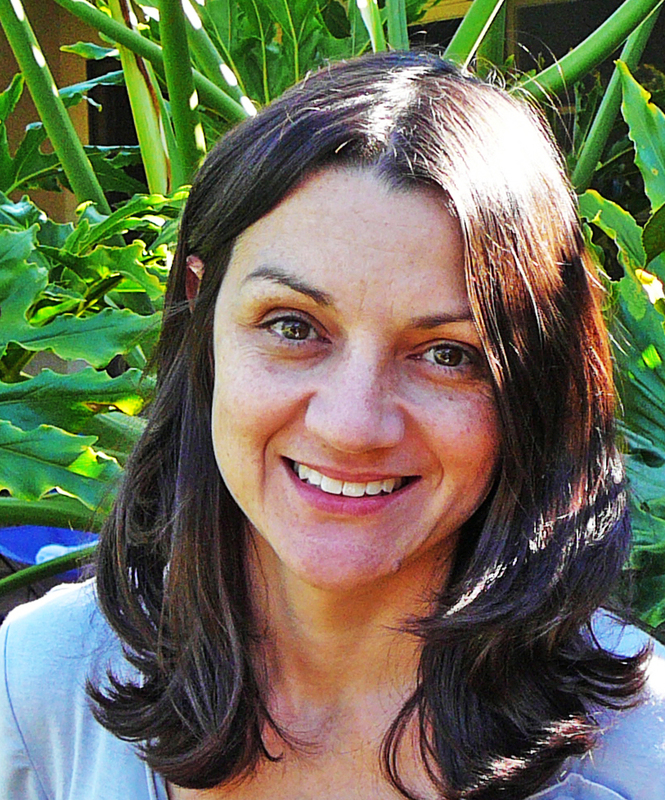 Ana Luisa Dziengel is an architect, award winning furniture designer, and creatively inspired mom making magic with her three kids in sunny Los Angeles!